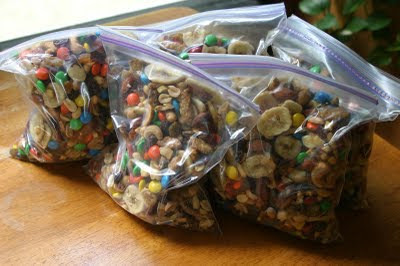 One "tradition" that we have when taking long road trips and vacations is to mix up some trail mix to take along. Over the years, I've developed my own recipe that fits our flavor preferences. Everyone likes difference things, so feel free to change to fit your needs! This photo doesn't actually represent the amounts I put in, just the bags I hadn't already opened! 2 - 17 oz cans mixed nuts - I prefer mixes with less than 50% peanuts. And Sea Salt! This makes about 1 gallon bag of trail mix. I find it easiest to mix in a large stock pot or bowl, but I have mixed directly in a gallon bag, or in a hard plastic gallon pitcher or container with a lid, and just shake to mix. I layer the ingredients as I add them to the pot, so it makes the mixing a little more even. 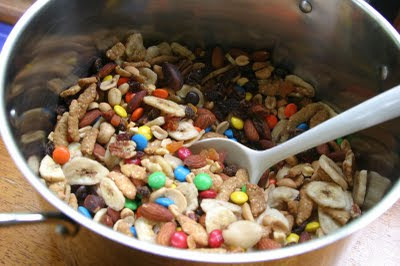 I've done other variations - using pretzels, larger pieces of dried fruit, raisins only, no banana chips, that kind of thing. I prefer to use candy coated chocolates instead of chocolate chips since the chips can be prone to melting into a gooey mess. Don't think this is low calorie because it's "healthy" trail mix. One time I calculated the mix I made (probably slightly different from the one I just listed, but not much) it it was in the neighborhood of 12,000 calories for the batch. Yeah. 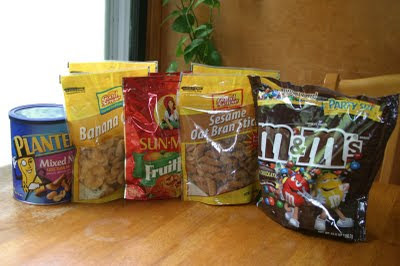 Chocolate, nuts, and dried fruit are not low cal, they are calorie dense. 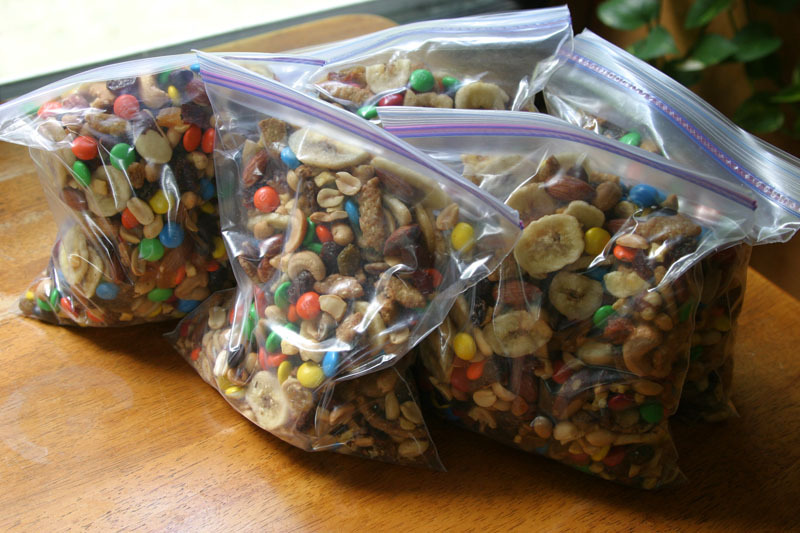 Hence people making trail mix so they can carry a lot of calories in a small amount of space. There have been some trips where the trail mix pretty much saw us through the day, but we clearly must have done some substantial amount of physical movement during our trips because we don't usually come away from a trip having gained weight after polishing off a bag in the course of a week or two (or was that a day or two?). Of course, the last time I really cared to check was when I was in my twenties, and before kids. Ah, how metabolism changes. I haven't done a full out calculation of costs recently, but a quick look at my receipt suggests I spent about $39 for about 121 ounces of trail mix (Yeah. 7 pounds?! That sure seems like a lot...) It comes out to about $.33 per ounce, which is cheaper than some of the similar mixes I've seen in bulk on Amazon. I know if I went with non-name brand products, and/or bulk products (like the sesame sticks or the banana chips) then I could definitely save more, but we like our mix, and it's certainly cheaper than buying in a gas station on the road! 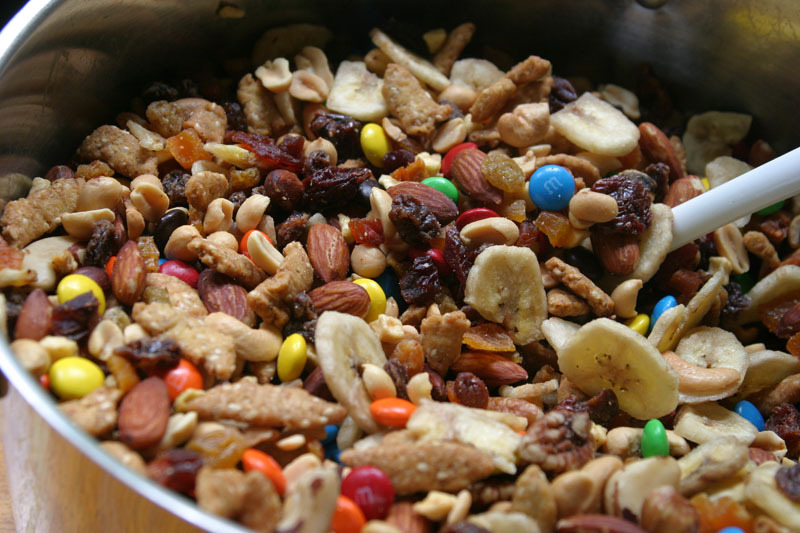 And, generally, we prefer the flavor of our particular mix since there is more fruit than just raisins, and it includes the sesame sticks, as well.